In February I noted the seizure of antiquities at a private residence in Paris as part of the Italian Operation "Ulisse". a bower of vines, a satyr riding a mule, and a cloaked woman making a sacrifice at an altar. 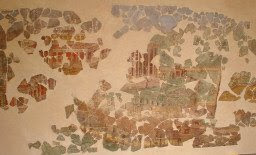 The three-metre long fresco is the largest landscape-themed painting ever found in the Vesuvian area. The trail of the painting has now been released. It was apparently in Geneva in the early 1980s (but where? in a private collection? with a dealer?) before being displayed "in the house of a rich industrialist in Brussels" (who?). It was found "in the house of French publisher and art collector Jacques Marcoux in Place Vendome [Paris] in February". The painting will be returned to one of the archaeological collections in the Bay of Naples area.